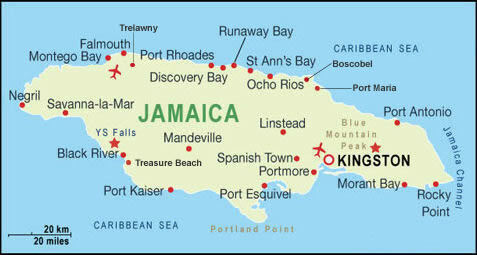 Jamaica have eleven major holiday resorts, these include Port Antonio  Portland, Montego Bay  Saint James, Negril  Westmoreland, Kingston  Capital of Jamaica, Ocho Rios  St. Ann, Discovery Bay  St. Ann, Treasure Beach  St. Elizabeth, Runaway Bay  St. Ann, Mandeville  Manchester, Trelawny  Cornwall and Boscobel Beach  St Mary. Jamaican hotel resorts cater for the budget holiday crowd to your luxury five star luxuries fit for a king. The hotel resorts are located on the coastline of Jamaica, with golden sandy beaches that are caress by the warm Caribbean Sea and surround by lush tropical rain forest. The beaches are well sheltered by the vibrant color coral reefs, making it ideal for all age to swim in the torques ocean. Jamaica has been a popular holiday destination and traveling to Jamaica has become more affordable in recent years. Make Jamaica your next travel destination and enjoy the best of this island paradise. The City of Kingston is the capital and largest city of Jamaica and is located on the southeastern coast of the island country. It faces a natural harbor protected by the Palisadoes, a long sand spit which connects Port Royal and the Norman Manley International Airport to the rest of the island. Kingston Norman Manley International Airport is located 10 miles from the city of Kingston. Montego Bay is located in the parish of St. James on the northwest coast of Jamaica. Montego Bay is the Jamaica main tourist destination with some of the largest resorts hotels in Jamaica. Holidays in Montego Bay are based in and around some of Jamaica largest resorts hotels in and famous holiday resort. The first tourists came here in the 1880's. Since then, this town has been visited by millions of foreigners. Ocho Rios Resort is a lively tourist orientated town on the north coast of Jamaica. It is located about 66 miles east of Sangster International Airport Montego Bay. Ocho Rios is an ideal location for exploring Jamaica's beaches, famous tourist attractions (including Dunn's River Falls Park, Bob Marley Mausoleum, Fern Gully, Dolphin Cove...), shopping, restaurant and lush surrounding countryside. Holiday accommodations in Ocho Rios are well suited to all visitors ranging from the budget end to more luxury five stars. Most of the major hotels in Ocho Rios holidays are on an all inclusive basis, but those who are looking for villa rental, self catering apartments/hotels and room only are well catered for. Port Antonio, located on the northeast coast of Jamaica, is one of the most beautiful destinations in this island. Although Port Antonio does not draw as many tourists as other more popular destinations in Jamaica, the town has many points of interest. A walk through town is a walk in history, with its narrow streets lined with buildings from another era, including the neo-Romanesque Anglican stone church (1840) and the charming gingerbread DeMontevin Lodge (1881), now a popular guest house on Titchfield Peninsula. Fort George (1729) overlooks the harbours, with its cannons pointing out to sea. Just outside of town lie the ruins of Mitchell's Folly, built in 1905 of cement and sea water. Treasure Beach Jamaica is wonderful honeymoon location. It's about a 2 hour ride from the Sangster International Airport Montego Bay. Treasure Beach area, on the southwest coast of Jamaica, is quickly becoming a popular destination among off the beaten path aficionados. Treasure Beach lies between the Black River and the alligator pond. Trelawny is a parish located on the northwest section of Jamaica in the county of Cornwall. Its capital is Falmouth. It is bordered by Saint Ann in the east, Saint James in the west, and parts of Saint Elizabeth and Manchester in the south. In 1770, the wealthy planters in St James and St Ann succeeded in having sections of those parishes become the parish of Trelawny as they were too far from administrative centers. Trelawny was named after William Trelawny, the then Governor of Jamaica. The first capital was Martha Brae located two miles inland from Rock Bay.